Starring Denzel Washington, Pedro Pascal, Ashton Sanders, Melissa Leo, Bill Pullman, Jonathan Scarfe, Orson Bean, Sakina Jaffrey, and Caroline Day. Robert McCall (Denzel Washington) is an app-assisted taxi driver by day, angel of justice at night, so when his latest mission to protect the exploited and oppressed strikes a little close to home, it sets him on a path of deadly vengeance to protect those closest to him. 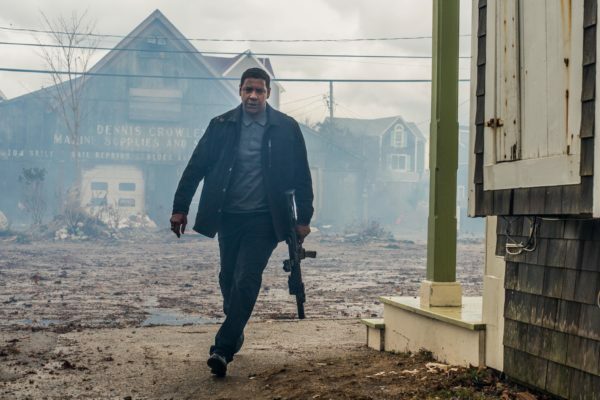 In his long, illustrious, award laden career, Denzel Washington has never felt the need to return for a sequel to any of his movies……pause for dramatic effect……until now. What made him opt for a sequel to Antoine Fuqua’s lucrative ($192 million), yet ramshackle adaptation of a British TV show from the 80s is anyone’s guess? Sure it’s in his wheelhouse of stoic, insular characters with the burdens of his past bubbling beneath the surface, but was anyone really crying out for the further adventures of Robert McCall? The Equalizer 2 gets off to a decent start, with some nice vignettes of the customers he picks up in his car adding emotional attachment to a film you might worry is all fists and fury, in fact it’s a department in which the sequel surpasses the original. The stakes seem a lot higher due to the personal link that McCall has with each of the characters affected by his increasingly dire situation, even if this means the bad guy can be predicted within seconds of his on-screen appearance (if you hadn’t already worked it out from the trailer), it makes the revenge aspect that much more satisfying than simply being about identikit Russian thugs. One unwelcome carry over from the first film is the rather silly Sherlock Holmes (Downey Jr. and Cumberbatch iterations) pre-fight deduction sequences. Washington’s phantom shape and gut punch brutality should be enough without having to resort to a stupid sixth-sense gimmick that turns him into a superhero. Thankfully it’s only used a couple of times, and one of those is punctuated by one of the film’s rare moments of humour, during which Washington tells a criminal that he’s about to incapacitate that he “expects a 5 star rating”. The action is more successful in scenes such as the attempted Uber assassination, in which close-combat is merged with gunfire and the violent in-camera POV shunting of the car. 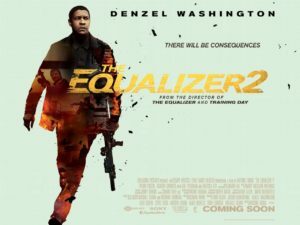 It might not be original, but it’s brilliantly executed compared to the pedestrian nature of the rest of the film, which features possibly the most tonally jarring set-piece finale in a long time, in which The Equalizer 2 essentially turns into The Hurricane Heist. It’s here that incomprehensible fights take place, as action tropes are ticked off faster than the bad guys. Where the film excels is with the cast, who really deserve better; Moonlight‘s Ashton Sanders brings charisma and heart to his role, striking up a decent chemistry with Washington, but soon becomes little more than a plot-device. The same could be said for Melissa Leo. Bill Pullman is hardly in the movie [again], and Pedro Pascal, so good in Narcos, is dialling it in with his pivotal role. 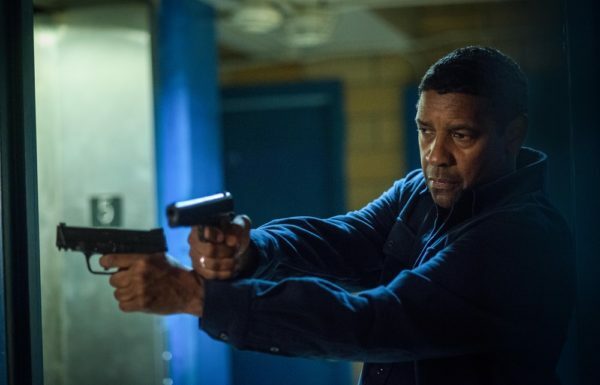 As with a lot of Denzel Washington movies, it’s left to him to elevate the material to a loftier perch than it deserves. To be honest, it’d be much more enjoyable watching him drive round for two hours taking fares, rather than skulk around for the same duration taking names.